Add £1 to your restaurant bill when you dine with us, and make a big difference to communities across the West Midlands! 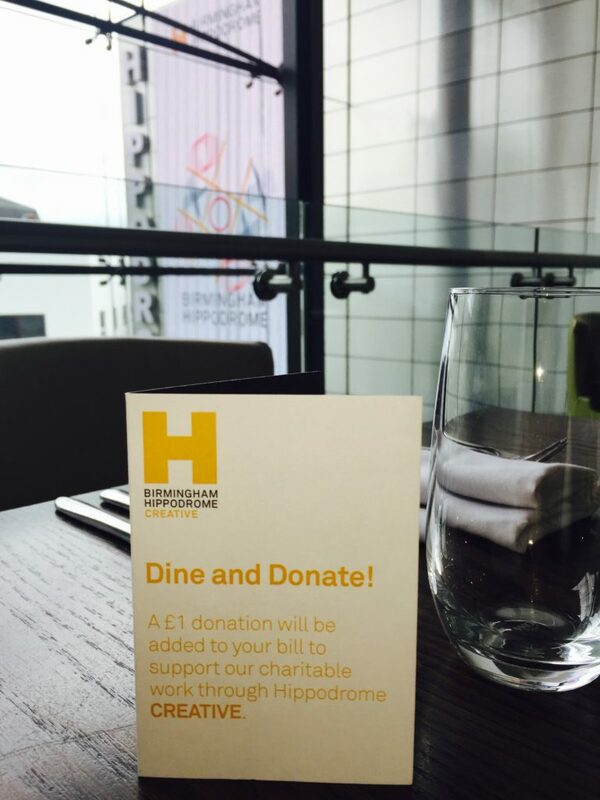 Dine & Donate with Birmingham Hippodrome! When you dine at our Circle Restaurant, we ask every table for a £1 donation when we present your restaurant bill. This supports our charitable work through Hippodrome Projects, bringing exciting arts projects to young people, vulnerable groups and families all across Birmingham and the West Midlands. During the past three years, over 300,000 people have benefited from our Hippodrome Projects programme, offering chances for all sorts of audiences to create, learn and perform with us. Small change really does make a big difference – since its launch last October, Dine & Donate has raised over £3,000 towards Hippodrome Projects, thanks to generous diners and donors – like you! To find out more about other ways you can support Birmingham Hippodrome Theatre Trust, visit our Individual Giving Webpages, call the Fundraising Team on 0121 689 3068 or email us.